Simi’s Story | Julie O'Neill Photography. 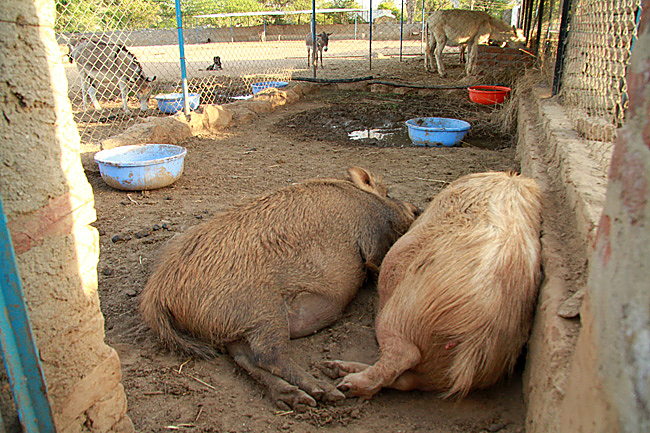 In many parts of the world pigs are consid­ered inferior animals. In India this is no differ­ent. Pigs are left to roam the streets fending for themselves. Mothers carefully maneu­ver their young piglets through traffic and away from people as they search for food. 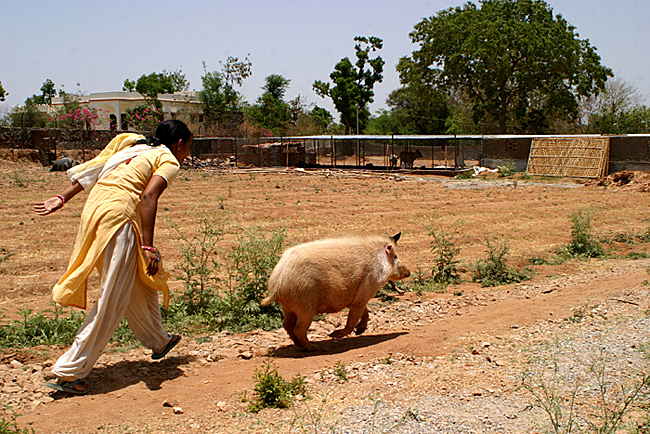 Mostly the pigs in India are ignored and feared by people. 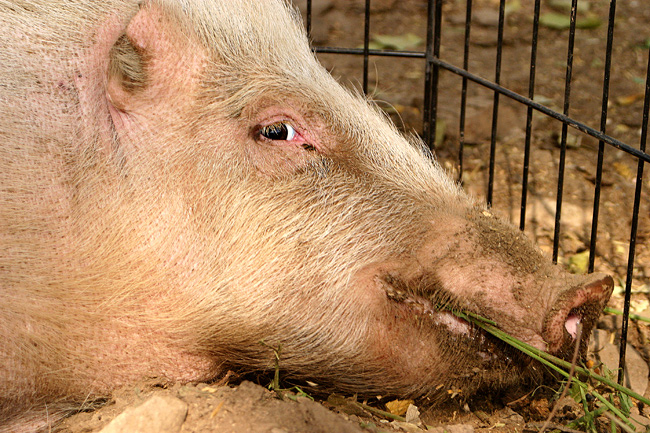 Animal Aid seldom receives emergency calls concern­ing pigs. 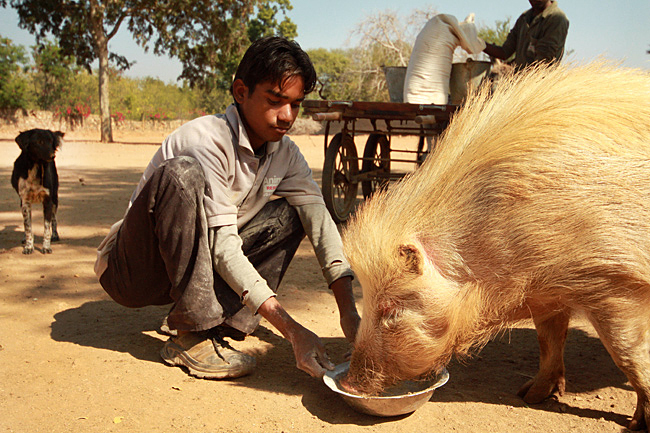 Occasion­ally however a kind person will reach out to Animal Aid to help a pig in need. Simi was one of these pigs. Simi was rescued off of the street in Udaipur, India. She had been hit by a car and was seriously injured. When the emergency team at Animal Aid brought Simi in she was unable to move her back legs. At the hospi­tal she was put into a small dog kennel to restrict her movements and to give her time to heal. After her initial rest period it was decided by the staff and volun­teers at Animal Aid to give Simi physio­ther­apy. The result of physio­ther­apy on the paralyzed dogs at the hospi­tal has been very success­ful but this was the first time that a physio­ther­apy program would be attempted on a pig. As a result of Simi’s size and general wildness five of the strongest staff had to work together to hold her down as others quickly massaged and moved her back and legs. It was a painful and scary ordeal for all of those involved. Poor Simi would scream in terror, snapping at us humans as we descended upon her daily. She was a strong girl and her fear of us was making matters worse. I decided that I must try to make this an easier process and I deter­minedly set out to make friends with this feral and intim­i­dat­ing pig. Each day for the follow­ing few weeks I would sit outside of her kennel (with lots of food) talking to her gently. Slowly she allowed me to touch her without shriek­ing in horror. Soon I had her eating out of my hand and allow­ing me to gently massage her legs without needing to call in for back up. 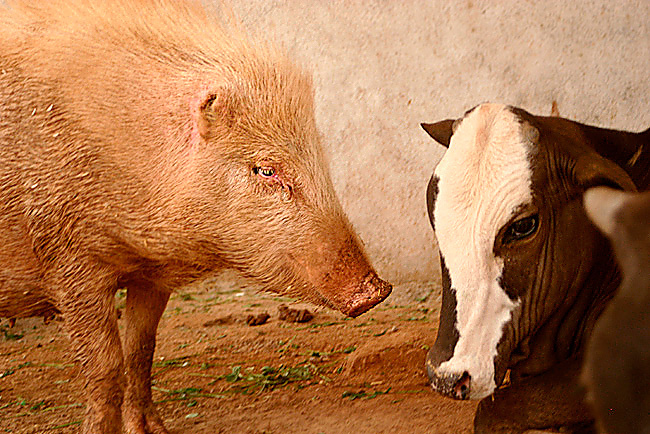 This was my first relation­ship with a pig and as she learned to trust me I was learn­ing about her. Her loyalty and affec­tion towards me grew to unexpected levels. Soon she trusted me completely. She would grunt when she saw me coming, wiggle her tail and roll over for me to rub her belly. Soon the bond between us was just as one would expect from a beloved dog. She loved me and I had fallen head over heels in love with her. We would cuddle together as old friends as I would brush and massage her, even clean­ing her teeth. After several weeks her mobil­ity started to improve and I was able to take her out of the kennel for short walks. Animal Aid built a “room” for Simi where she could live safely away from the other animals, roll in her own mud puddle and bask in the sun. Shortly after moving her into her new home we realized that Simi was pregnant! 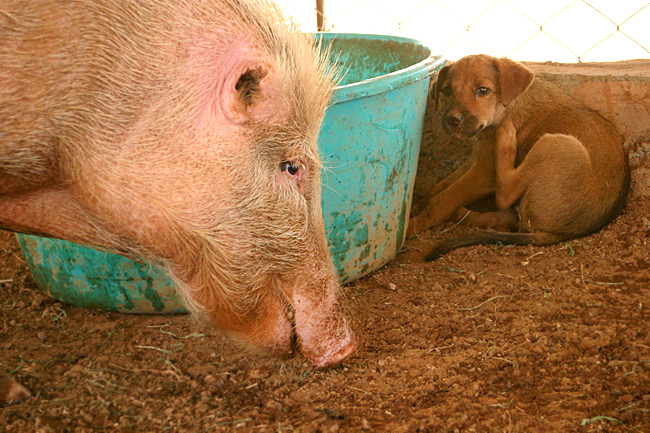 Now not only did Animal Aid have its first resident pig but a pig that was in labor. After a gruel­ing 24 hours of labor we knew that Simi was in trouble and we would need to inter­vene. 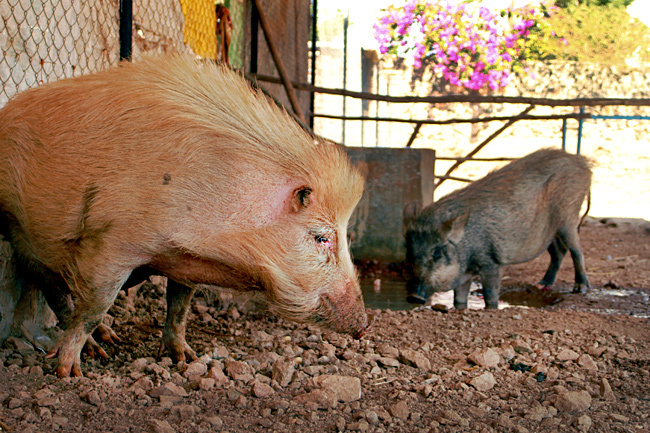 None of the doctors at Animal Aid had any train­ing or experi­ence with pigs. After quickly looking online for help it was decided that an emergency C-section must be performed. The medical team quickly learned that pigs typically receive IV through the veins in their ears because of the thick­ness of their flesh. Simi’s ears had been cut off as a piglet on the street signi­fy­ing that someone planned to catch her and slaugh­ter her for meat once she was bigger. Since giving her IV was impos­si­ble the doctors had to use local anesthe­sia and leave her completely conscious as they sliced her open to remove her babies. It was a terri­fy­ing day. Almost all of the staff at Animal Aid was needed to assist in her emergency surgery. I was Simi’s closest friend and kept her head in my lap, comfort­ing her through the entire, horri­ble ordeal. I was so scared that we would loose Simi after she had made such a mirac­u­lous recov­ery. After what felt like a lifetime Simi’s 3 still­born babies where removed from her, she was stitched back up and moved into a sterile room inside the hospi­tal build­ing. Although she had survived through it all we were now even more worried than ever for Simi. She slid into a serious depres­sion that even I couldn’t cheer her from. For days Simi refused to eat and drink. She was mourn­ing for her babies who had all died, her heart was broken and so was mine. I spent my days sitting with her quietly, begging Simi to find the strength to recover and to live. The decision was made that Simi needed to be moved as quickly as possi­ble back outside into the sunshine and mud where she was the happi­est before her terri­ble surgery. Slowly Simi’s mood started to improve again. Just as Simi was becom­ing her old self again I needed to leave Animal Aid and return to Canada It would be the first time that I would leave India since Simi was rescued. Leaving her was incred­i­bly hard. I swore to her and to myself that I would return as soon as I could. I kept my promise and I returned to India, Animal Aid and Simi 2 months later. I couldn’t stay away. The prior­i­ties that I had at home could not out weigh my prior­i­ties at Animal Aid. 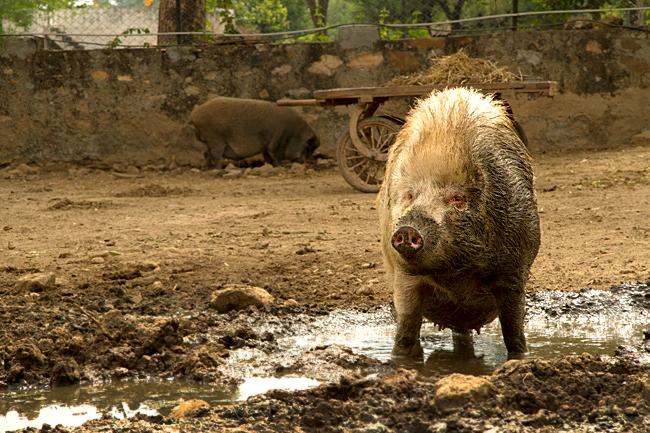 It was upon my return that I learned so much more about the nature and person­al­ity of pigs. As much as Simi had reminded me of a dog with her intel­li­gence, loyalty and ability to trust she was now showing me her other pig like traits of headstrong moodi­ness. 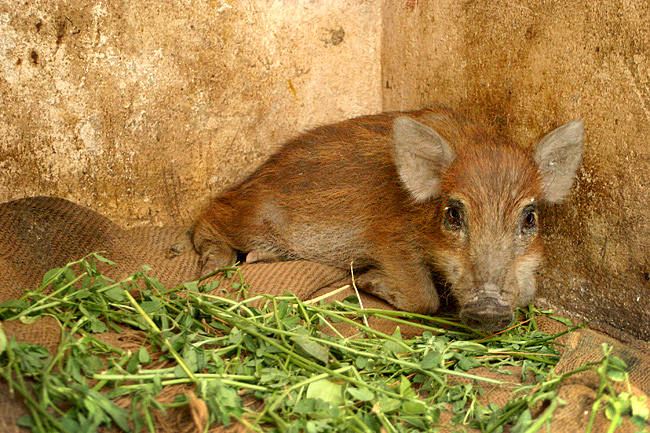 After my long journey back to Animal Aid I excit­edly ran down to see Simi in her pen. When she heard my voice she swung her head around and ran towards me. I thought that she was excited to see me, but in fact Simi was majorly pissed off at me for leaving and was charg­ing at me in anger. I would be lying to say that Simi’s hateful attitude towards me didn’t hurt my feelings. It was hard to see the anger in my old friend’s eyes when she looked at me and tried to bite me when I would touch her. Even worse was where her rage was coming from. More than ever I realized how strongly Simi bonds with those that she loves and how hurt she must have been when I left her. From then on I never allowed our relation­ship to get as close as it once was and instead I focused on finding Simi new friends. Over time Simi forgave me and once again welcomed my belly rubs, but from then on I was not going to be the only one that spent quality time with her. 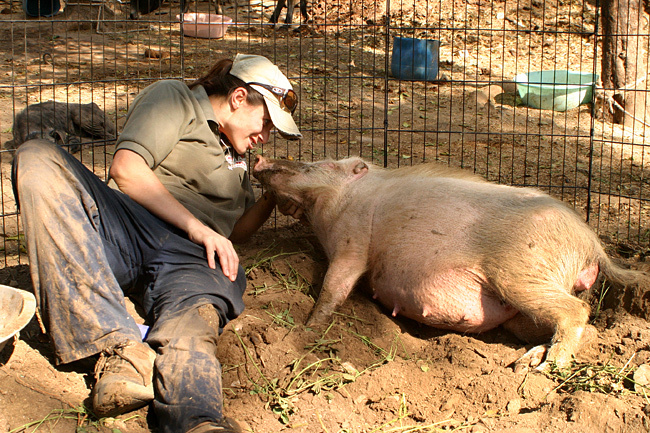 Simi bonded with many of the staff and other animals at Animal Aid. Once they got to know her loving and quirky person­al­ity they fell for her too. 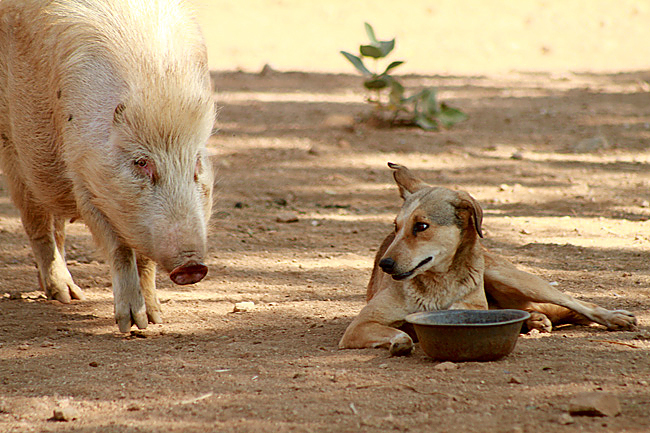 One day Animal Aid rescued another injured pig. His name was Howie. He was just a few months old and also couldn’t move his back legs requir­ing time to heal and physio­ther­apy. I instantly thought of Simi and how great it would be for them to share their lives together. As soon as Howie was strong enough and able to use his back legs again we took him down to meet Simi. The moment that we put Howie into Simi’s room she flung him up into the air with her nose and gave me the evil eye that Simi was so very good at. Luckily I was able to catch poor little Howie before he hit the ground and had to endure more of Simi’s jealous rage. It seemed that this might not be as easy as I hoped. Over time we moved Howie to a place where Simi could see him regularly (through a fence) and hopefully get comfort­able with him being around. Months later Howie had grown into a big boy and had regained full mobil­ity of his back legs. He was strong enough to defend himself so we gave the Simi/Howie intro­duc­tion another go. Simi insisted on being cranky but Howie was so excited to be with one of his own kind that he didn’t seem to mind. Within a few days Howie had melted Simi’s cold heart and won her over. Soon he was cuddling up to her, sharing her food and she was even letting him dominate her once in a while. Simi was in love again. Watch­ing the two of them together warmed my heart. I finally felt comfort in knowing that Simi had found the life partner that she always craved. For the next three years Simi and Howie would spend each day together roaming in the field, rolling in the mud and steal­ing food from the cows, donkeys and dogs with whom they shared their home. Each night they would snuggle up tight together and fall asleep. 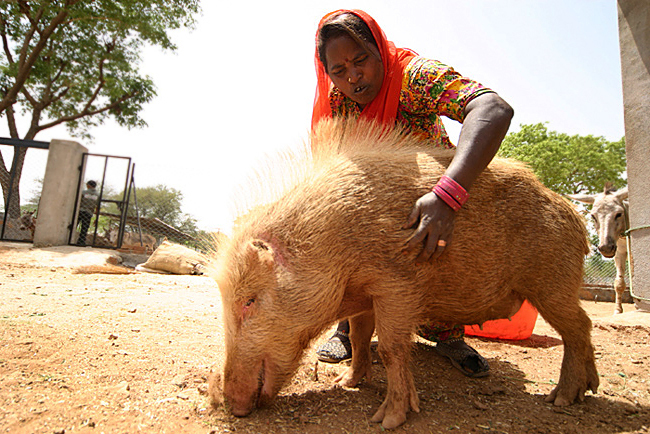 As the years passed Simi became a matri­arch of Animal Aid. She was clearly the boss of the large animal yard and she always got her way. She had grown into a big girl full of person­al­ity. Her moods contin­ued to be her own and her devotion to those that she loved never wavered. In the fall of 2012 after 4 ½ years together at Animal Aid Simi and Howie both caught some kind of bug. They each had a fever and refused to eat. Simi recov­ered within a few days but Howie contin­ued to get weaker and weaker. The treat­ment that the medical staff gave him didn’t help and Howie’s condi­tion contin­ued to get worse. Simi was healthy and her old self again, but sadly Howie never recov­ered. Howie died of an unknown illness at Animal Aid on Septem­ber 29th 2012. Within a few days of Howie’s death Simi stopped eating once again. Although she didn’t appear to be ill Simi became lethar­gic and uninter­ested in food. Only 6 days after the passing of Howie, Simi’s heart simply stopped beating as she lay in the shade missing her best friend. The loss of both Simi and Howie is blow to the hearts of all that knew and loved them. Simi was a tremen­dous life force and one of those special ingre­di­ents that makes Animal Aid such a magical place. 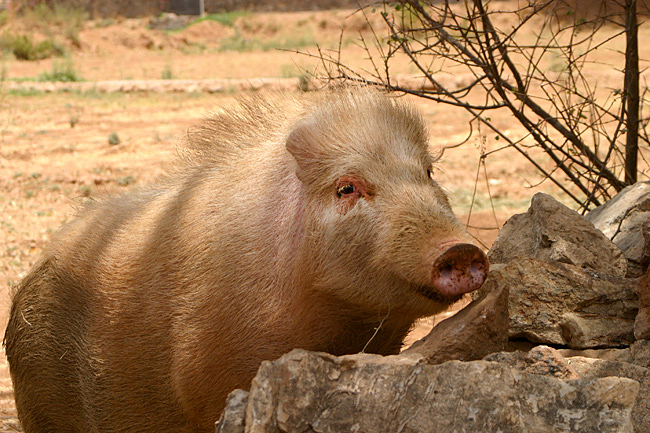 Simi was the first pig to call Animal Aid home and proba­bly the first pig to ever receive such medical inter­ven­tion, care and love in all of India. We have learned so much about pigs from Simi. Most impor­tantly she has taught us of the extreme zest for life and love that all pigs are capable of. Although life on earth does not seem quite as full without Simi I take comfort in knowing that she is where she belongs, with her best friend. 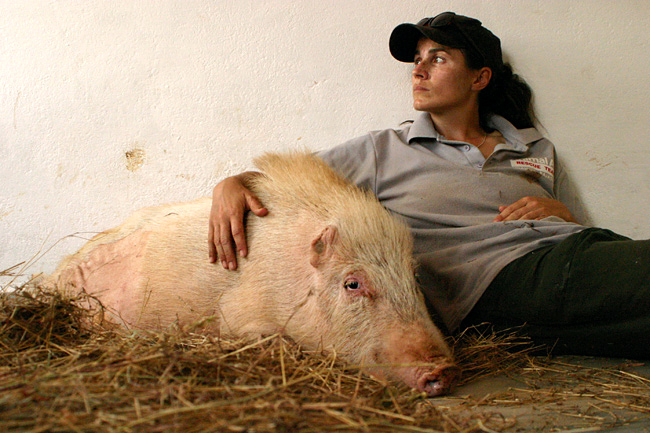 Thank you Simi for coming into our lives and teach­ing so many of us just how special pigs are. What a bitter­sweet tale. Animals have a way of touch­ing us in ways both similar to and yet so differ­ent from the way in which humans affect us, even if they seem to hurt us when we project anthro­po­mor­phic traits and senti­ments onto them. I tend to think that we are so touched by animals because we realize that good or bad their actions are innate at the core and involve no pre-meditation or petty intentions. Oh my God, Julie. That’s really all I’ve got right now. Have to collect myself. Will share this beauti­ful story. 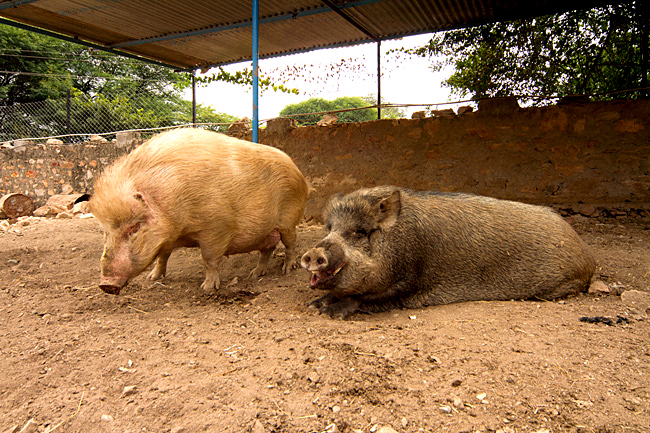 In response to Mo’s comment– there is no anthro­po­mor­phism when dealing with pigs. Every emotion is right there– visible to the eye that knows how to see it. Their emotions are EXACTLY the same as ours. That is not surpris­ing, consid­er­ing how like us they are in so many other ways. Simi was angry at Julie for leaving her, plain and simple. I’ve seen it myself in our Georgie boy, who had to be boarded for 6 months. He was furious with me. Within days of bring­ing him home, he’d forgiven me. They are truly special creatures. Thank you for these bauti­ful photos and such a touch­ing story! I love pigs and would like so much to be able to share this page on FB! Many of us are doing our best sharing animal posts for “human(e) awareness. Thank you so much, for your dedica­tion to Simi and Howie, but especially for your photos and record­ing of your time with them. This is the kind of story that we need people to see, to fully compre­hend the incred­i­ble sentience and suffer­ing of the animals we so frequently think of as just “livestock” or “meat”. I met the family that runs this rescue while I was at the Portland VegFest, and I was so impressed with their love and dedica­tion. How wonder­ful you got to be there! I’d love to visit India someday, it’s on my bucket list, and this is the first place I would go (and I have a feeling I would never want to leave). Wow. What a story. Very, very touching. oh my gosh .…I just cried reading this.….